I am very pleased to join you today for the luncheon of the Belt and Road Summit, the second in two years organised jointly by the HKSAR Government and the Hong Kong Trade Development Council. Yes, it was just four months ago that President Xi Jinping opened the Belt and Road Forum for International Cooperation in Beijing. I was fortunate to be there, alongside 1,200 delegates from more than 130 countries and 70 international organisations. On that occasion, President Xi reiterated to the global gathering that the Belt and Road Initiative is being built for mutual prosperity, deepened understanding and friendship. That it is open to all who are interested. Open, fair, transparent and international are in fact the indispensable building blocks of Hong Kong's success in the global economy; success forged on free trade, as well as on the free movement of capital, goods, talent and information in and out of Hong Kong. Our open and fair market treats all companies the same regardless of size or origin. Our infrastructure is world class. Our professional services are top notch. All these, underpinned by a common law legal system with a fine tradition of rule of law and independent judiciary, have attracted more than 8 000 foreign and Mainland companies to set up their offices in Hong Kong, including 75 of the world's 100 largest banks. Over the past 23 years, the US (United States) based Heritage Foundation has named Hong Kong the world's freest economy. And for the past two years, the World Competitiveness Yearbook, published by the International Institute for Management Development in Switzerland, has named Hong Kong the world's most competitive economy. Add our unparalleled connectivity with the rest of the world and first-mover experience with the Mainland of China, and it's clear that Hong Kong is the natural premier services and capital hub for the Belt and Road and its far-reaching mission. That's particularly true for infrastructure financing and financial connectivity, both of which lie at the forefront of the Belt and Road Initiative. Hong Kong's stock market offers some of the best liquidity in the world. We were ranked number one for funds raised through initial public offerings over the past two years. And last year's total came in at more than US$25 billion. Indeed, we have been among the world's top five in IPO fundraising since 2002. That level of success, year after year, pays off with trust today - confidence in Hong Kong and its ability to raise capital for Belt and Road infrastructure development, through IPO or post-IPO financing. It helps, too, that the Securities and Futures Commission, our regulator for securities and futures markets set out, in April this year, criteria for assessing the eligibility of infrastructure project companies to list on our Main Board. The Commission's statement provides a clear pathway for infrastructure project companies looking to list in Hong Kong. Apart from IPOs, we also offer a great variety of financing avenues – syndicated loans, private equity funds, bonds, sukuk and much more. The vast corridors of the Belt and Road embrace a significant Muslim population. And that can only boost Islamic finance in the coming years and decades. Here, too, Hong Kong is well prepared, having issued three sukuk over the last three years. The latest, in February this year, made Hong Kong the first AAA-government to launch a sukuk with a 10-year tenor. For more than a decade, we have been at the forefront of the Mainland's financial liberalisation and Renminbi internationalisation. The results speak for themselves. But let me add a word or two about the Chinese currency. Hong Kong is the world's leading offshore Renminbi business hub, blessed with the largest pool of Renminbi liquidity outside the Mainland. In fact, about 70 per cent of offshore Renminbi payments are handled by banks in Hong Kong. Many corporations looking to expand their businesses to countries along the Belt and Road see a need to manage their risk exposure and to set up a corporate treasury centre to centralise the financing and liquidity of their regional subsidiaries. Our multi-disciplinary professionals and our cross-jurisdiction dispute resolution services stand ready to assist. In addition, last year we passed a law providing tax concessions for qualified corporate treasury centres set up in Hong Kong. The good news doesn't end here. Just two days ago, in the Philippines, we announced the conclusion of negotiations for the ASEAN-Hong Kong Free Trade Agreement (FTA), which will be formally signed in November. The ASEAN-Hong Kong FTA will surely enhance Hong Kong's role as a super-connector, risk manager and pre-eminent services provider between the Mainland and ASEAN member states under the Belt and Road. ASEAN, of course, is already Hong Kong's second-largest merchandise trade partner. And the FTA will surely further strengthen our buoyant economic ties, fast-tracking the flow of goods, services, investment and cultural exchanges between Hong Kong and ASEAN, thereby expanding business opportunities and stimulating growth throughout the region. 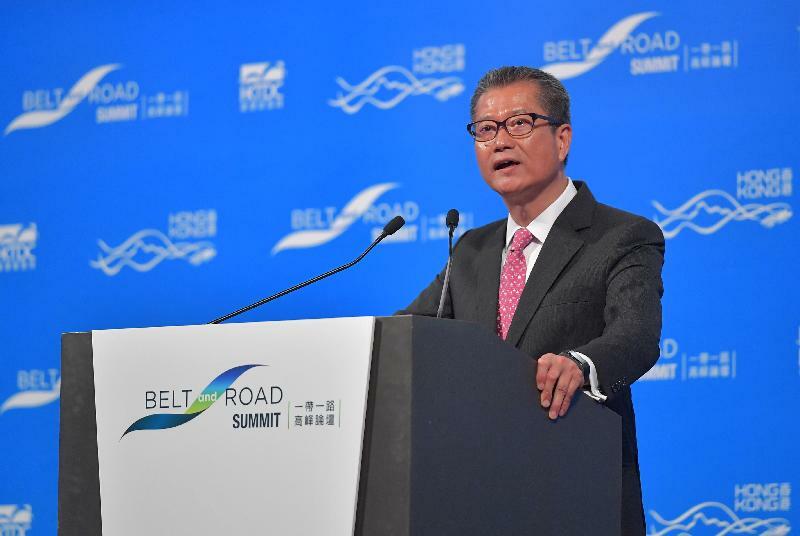 Bringing Belt and Road players and projects together was central to the creation, last year, of the HKMA (Hong Kong Monetary Authority)'s Infrastructure Financing Facilitation Office. And I can tell you that all expectations are being met. To date, the Office has brought together more than 70 partners from all over the world. They include banks, multilateral agencies, project developers and operators, financiers, institutional investors and professional services firms. There's more. In mid-June, Hong Kong formally became a member of the Asian Infrastructure Investment Bank (AIIB). Let me add that we are liaising with the Bank, looking for ways to use Hong Kong's financial services strengths to support the AIIB. I have time for one last glittering spotlight on the future. Hong Kong's future. I'm talking about the Guangdong-Hong Kong-Macao Bay Area, situated at the fast-beating heart of the 21st Century Maritime Silk Road. In March this year, Premier Li Keqiang announced the study of a development plan for this Bay Area, which is China's richest region, covering Hong Kong, Macao and nine cities in Guangdong province including Shenzhen, Zhuhai and Guangzhou. With a total population of more than 66 million and an aggregate GDP (gross domestic product) of over US$1.3 trillion, the Bay Area compares favourably with Australia or the Republic of Korea. With the development plan in place, the Bay Area will accelerate the flow of people, goods, capital and information across the region, presenting enormous business opportunities for Hong Kong and overseas companies. Ladies and gentlemen, emerging markets today are the global economy's critical growth engine. And it is essential to promote infrastructure and other investments if we want to maintain sustainable economic development and improve the quality of life of people throughout the region. That will demand both visionary strategies and concerted co-operation between governments, businesses, communities and institutions. Today's gathering, and the wholesale exchange of information and ideas it incites, can only help. I wish you all a rewarding Summit and a future in the fast lane of the Belt and Road. And for our guests from the Mainland and overseas, the most enjoyable stay in Hong Kong and a safe journey home.